Time to Cultivate – Why Knot Friar? Time to Cultivate“Some seed fell among thorns, and the thorns grew up and choked it” (Mt. 13:7) Traveling from Minnesota to Texas and everywhere in between I’m always on the move. Vocation work requires me to move outward and meet people where they are at. My role is to nurture the call from God working in the soul who desires to do the Lord’s will. Along my travels I saw the most tragic thing on the roadside. 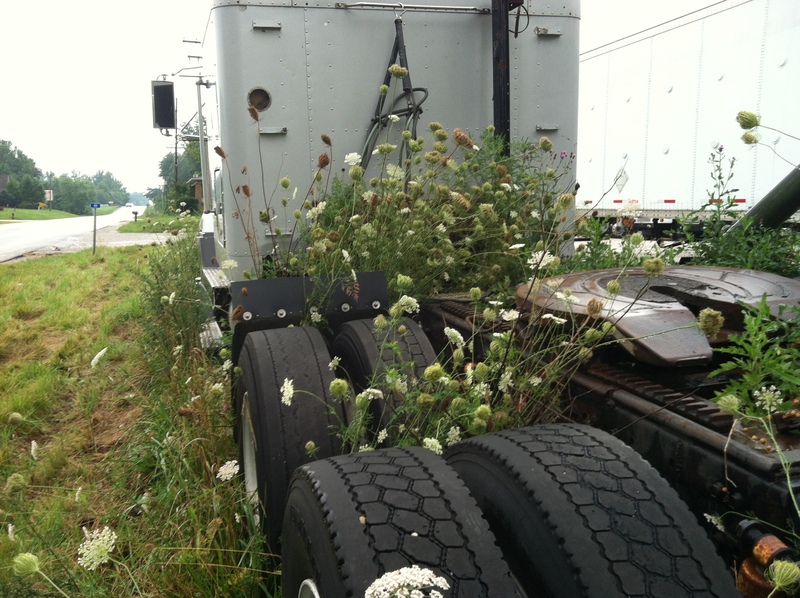 It was a semi tractor overtaken by weeds. A machine that was made to be on the move, rolling down the road and it was covered in weeds. Wheels made to turn, motor made to rumble, a commander’s chair made for hauling and all were held captive by weeds choking out the truck’s purpose. The essential nature of the very thing a truck does requires movement. The purpose of a truck is to move! Somewhere along the way that movement became stationary and the weeds choked it. It was the saddest thing ever seen. We Franciscan Friars are called to be on the move. It is uniquely tied to our charism. Francis received the Gospel mandate to go forth to the world and be a missionary to plant the Gospel (Mt. 19:21 Jesus said to him, “If you wish to be perfect, go, sell what you have and give to [the] poor, and you will have treasure in heaven. Then come, follow me.) St. Francis of Assisi was called to carry the Gospel from Assisi, Italy to the streets of the world. The Gospel message so moved his heart that he could not remain stationary. St. Francis was the messenger and sent it to the streets. Today there is not one continent on the globe that lacks a Franciscan presence to witness the Gospel. This is why the Gospel continues to move outward today and cannot remain parked on the shoulder, overrun by weeds. We all have a spiritual message to deliver with the collateral of our lives. This message cannot remain stagnant. Either we move upward and onward toward our eternal destination, or the weeds will immobilize us. What part of your life needs a bit of weeding? Is there a neglected area that requires some focused attention? An addictive behavior? A bad habit at work? An internal voice that nags you with the repeat switch of shame? Selfish time that could be filled with charitable outreach toward others? We are called to be on the move. The saints before us like St. Francis shared the Gospel and moved on. Spiritual growth requires us to nudge forward and move on. Keep those wheels rollin’ and see you at the next rest area! Reflections about Our Lord, St Francis and Life. Lord, you know all things. Learn more about St Francis of Assisi and how to become a Friar. Why not be a Franciscan Friar, what else is there?